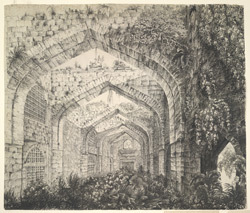 Pencil and ink drawing by Sir James Abbott of the Hindola Mahal at Mandu. Inscribed on the original mount: 'Hall of Audience Maandoo the ruined capital of Malwa. J. Abbott del. from Nature AD 1835'. The Hindola Mahal or ‘Swinging Palace’ is part of the Royal Enclave in the northern part of the historic ruined citadel of Mandu. It is probably late-15th century in date and was designed as an audience hall under the reign of Sultan Ghiyath Shah (ruled 1469-1500), famed for his hedonistic lifestyle. It is built on a T-shaped ground plan with delicate stone tracery windows and is so named for its sloping side walls. An ancient stronghold, Mandu first came to prominence under the Rajput Paramara dynasty, famous for their patronage of the literary arts, who ruled the region of Malwa in central India with their capital at Dhar. Their reign ended when Malwa was absorbed by the Delhi Sultanate in 1305. In 1401 Dilawar Khan broke away from Delhi and established an independent sultanate. Mandu's golden age came as the state capital of the Sultans of Malwa between 1405 and 1531. They renamed the fort ‘Shadiabad’ (City of Joy) and built palaces, mosques and tombs amid the gardens, lakes and woodland within its walls. Most of the remaining buildings date from this period and were originally decorated with glazed tiles and inlaid coloured stone. They constitute an important provincial style of Islamic architecture characterised by an elegant and powerful simplicity that is believed to have influenced later Mughal architecture at Agra and Delhi.